IAGB is excited to a re-imagined India Day Festival on August 19th at the Boston City Hall Plaza. In addition to other traditional attractions, there will be a new interactive program which will launch in May. IAGB will be scouting for talent in individuals and groups through its "IAGB GOT TALENT" competition. Individuals and groups can submit their talent exhibitions as video recordings through platforms soon to be announced. 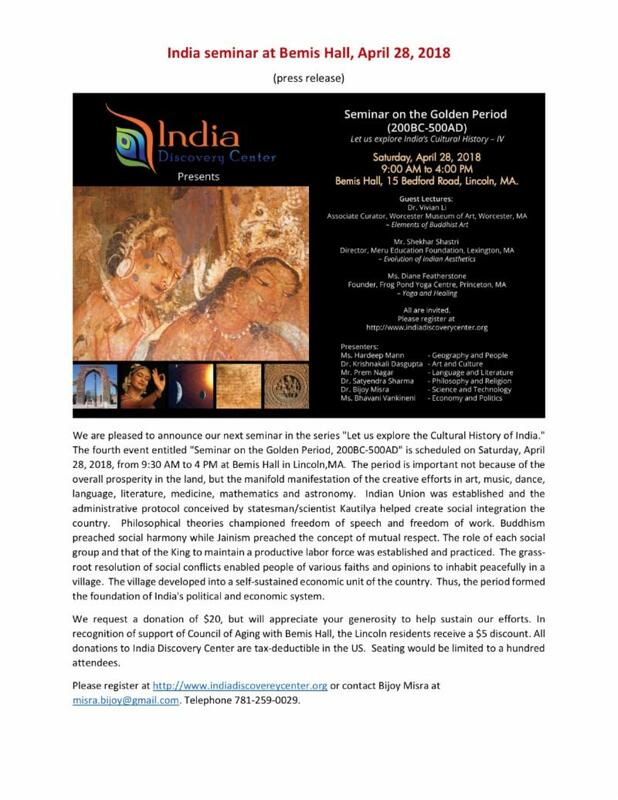 A select few "performers" will be chosen and given a platform to perform at India Day Festival. IAGB joins the Indian American community in congratulating the many individuals of Indian American origin who participated in recent town elections across the state. Participation at the local level is the first and most important step in weaving our community into the our new homeland fabric. We extend our hearty congratulations to all the winners, some of whom also happen to be previous IAGB board members. Do people in America face Hunger ? More than 41 million people face hunger in United States. That’s more people than the entire population of Canada. And it means that across our nation, people simply can’t make ends meet. High housing costs, rising food prices and unexpected expenses have left millions unable to stretch their dollars far enough. Hunger can be hard to spot in America, unlike India. Our country, where we live is affluent by global standards, yet there are families in every county in the U.S. who can’t afford to stock their cupboards with the food they need. There are a few myths about Hunger according to Feeding America, one of them is that there’s a hunger crisis in other parts of the world - not in America. Another perception is that most of the households that are served are not homeless and they have at least one working adult. In homes across the nation, there are people who wake up with the sun and turn out the lights late. They’re working nearly every day, giving back to their community and raising a family. Even though they’re pinching pennies, they struggle to fill their plates with the food they need to keep going. Another fallacy is that hunger is most frequently found in cities. Hunger is common in rural areas, including some of the farming communities that grow America’s crops . Seventy-five percent of the counties with the highest hunger rates in America are in rural areas. Limited access to jobs, transportation and education make it tough to earn a living in remote areas like rural Alaska. Some are forced to choose between paying for groceries or other essentials like heat. This is an especially difficult choice for parents during the winter, and it’s all too common. By reducing food waste in America, we can also help reduce hunger. Seventy-two billion pounds of good food goes to waste each year in America, while at the same time, 41 million people struggle with hunger. One of my oldest childhood memories is that whenever we used to travel and go to public places, especially temples in India they would be lined with beggars and children begging. It was a sad sight and even to this day it remains. If you give one of them some money the others swarm you. It is one of the social evils in India. So now in the country that we have chosen to live in and raise our children let us recognize that hunger can impact all people at various stages of their lives. There are a number of ways you can help combat the issue and stigma of hunger. 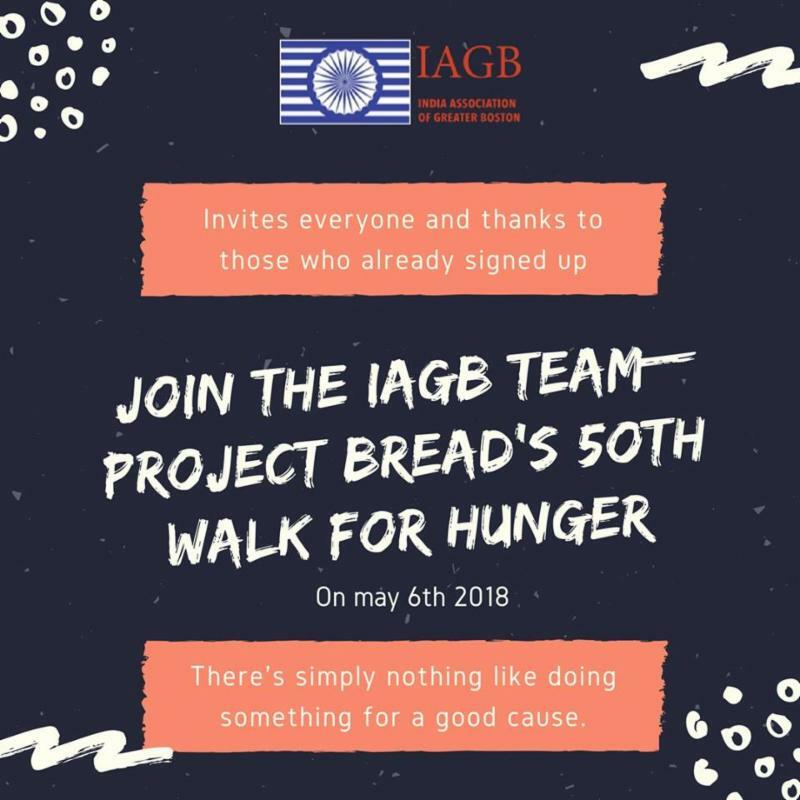 One of the ways that IAGB has chosen as part of community services initiative is to participate in Project Bread’s Walk for Hunger, on May 6 th , 2018. Come join team IAGB and register at http://www.projectbread.org/walk-for-hunger/ . Come talk to fellow members and make it a fun walk. If you cannot physically participate in the walk, please do consider a donation. 1 in 10 residents and 1 in 7 children in Massachusetts doesn’t have enough food. In 2017 the walk funded 156 food pantries, 37 child nutrition programs, 38 Community meal Programs and 32 Farm and Garden Initiatives. We don’t wait for change , We Walk For It, join team IAGB. The word “sexism” has long been ignored than “racism”, even after 70 years of fight for women’s rights in this country, more than a century ago. If you don’t agree, then why in the 21 st century are we still witnessing wage gap, no woman president, existence of male dominancy in businesses or hearing voices of “me too”. Something to think about, isn’t it? We teach our kids that men and women are equal throughout their youth but when they step into the real world, it’s a different scenario all together. A young lady is questioned for every choice she makes, from education, to career to personal life. There are only a few who break the barrier of this judgmental society and do what they really want to do. Because the world believes that it is OK for a man to fail many times to become successful, whereas a woman’s opportunity is limited. On the side note, civilization hasn’t been harsh to just women, in fact, men are victims too! The pressure of them being the main breadwinner has made them more successful than women, compelling them to take bigger risks in life. So, why have we not let our children believe that girls are “also” the breadwinner of the family and not “could be”, and that it is inevitable to face failures, take risks and find success to protect her family. We are not here to discuss numbers on underrepresentation of women leaders or women in entrepreneurship in this country, because we can find that data everywhere. Although, we could evoke on some of the fearless women around us and comprehend the importance of teaching our girls to face fears, take equal risks as men, and become leaders in every field. This first world country hasn’t seen the light of a woman presidency yet, not seen a women entrepreneur as influential as Steve Jobs or Elon Musk. Are women being bottled-up every time they reach new heights? Hilary Clinton, is the second woman who stood for Presidency in the United States, preceding Clinton was Victoria Claflin Woodhull in September, 1838. Clinton’s biggest challenge during the presidential race was demonstrating her authenticity and ensuring voters she’s trustworthy after the news broke on her email scandal. Her voters distrusted her and did not give Clinton a second chance, however, they leaned towards Trump who came with much more controversial track record. Similarly, Elizabeth Holmes, an entrepreneur, who had a vision to bring a medical device that can detect any disease with just a finger prick. She was believed to be the next Steve Jobs, with her work ethics. Her company was brought down after learning her technology was not accurate and it was a sham. She was scrutinized to a level that made people question if women entrepreneurs could become global business leaders. Although there are many men who failed or screwed things up, but they were called “the revolutionaries”. Holmes after losing her billion-dollar company, did not give up on her mission. She is starting it all over again. We need more and more fearless woman like her to keep failing and keep raising from the ashes. Women need to show that it’s okay to fail many times to become successful. More women like Clinton should rise, stand in the toughest of the toughest elections again, and not fear a bit on losing. One women candidate every presidential race should become a norm. How could we bring this change? The major part of this transformation is focused on the next generation. We could start by supporting and encouraging little girls and young women toward STEM subjects, Political Sciences and Entrepreneurships, teaching them they can and should create their own enterprises. We need to give them confidence to make decisions, take risks and execute their ideas to the real world without having to worry about the consequences of failing. Teaching children that men and women are equal and that they both are the breadwinners of the family. For changes now, we could start supporting women run small businesses by providing resources in terms of mentorships, funding or skills to help get them to the next level. Creating more programs within the government or private corporations and organizations to identify women capable of leading and bringing change. We need leaders like Mayor Walsh in every town who has been committed in advancing women in all aspects of life. In addition, analyzing your next women councilor or electoral based on the individual’s capabilities without discrimination. These changes may take decades, but only by fostering more significance in this matter, impregnating more power, support and encouragement to the next generation of women we will be able to close the gap of women leaders and entrepreneurs that exists in this country. We could take small steps by giving back and reaching back to help, as female owned business and startups still lack the resources they need in order to succeed. Mentor a female entrepreneur or simply inspire another woman because she could be the next Angie Hicks of Angie’s List, Sara Blakely of Spanx or even the first woman President of Unites States of America. Below are some of the local organizations or platforms that provides resources for women: IFUNDWOMEN , WE Boston , Women’s Entrepreneurial Council (WEC), Center for Women & Enterprise (CWE), Wonder Women Boston (WWB), Girls who code , Rails bridge Boston and The commonwealth institute . This month we are shining the SPOTLIGHT on Bipin Parekh, Radio Jockey at Gunjan Radio - 91.5 FM WUML - a community radio program . Bipin Parekh : In the US my first foray was as a volunteer in the student association at SUNY Buffalo. I was always active in helping out in organizing cultural events which continued later when living in Philadelphia too. Only after moving to Boston area did I start taking official roles in nonprofit organizations. It first started with Gurjar in early 80s. At that time Gurjar and IAGB were the two major organizations run and catered for Indian diaspora in the Greater Boston area. Gurjar was mainly into organizing Navratri event and children’s programs, with some variety entertainment. I started volunteering for their events and as time progressed I was drafted officially into their committee as Director and later I became the President. I was Gurjar president for 3 years (84 – 87) in my first stint. I continued to serve in various capacity as Secretary, Treasurer and even came back as President twice more over the years. During those years we use to work with IAGB closely. While I was at Gurjar a friend of mine, Narendra Popat started Gunjan Radio at UMass Lowell and asked me to help him out with music. Initially I started with giving him the music but later it became a full time commitment starting in 87. IAGB : What’s your motivation for community service and how would you describe your philosophy towards community service? Bipin Parekh : The reasons for my motivation goes back to my upbringing and my early days growing up in India – I am sure all of us have experienced this - you have people helping out at different stages of your life. In my case I went through Indian public school system and later was lucky to get some scholarship during my college. These things don’t happen in vacuum – India is not a rich country but somebody has made an effort to put these systems to be in place. Now I feel it’s time to give back to community in some way shape or form. As for my philosophy – I would like to highlight 3 important things. The first thing about community service for me is – to give back to the community without expecting anything in return. This way you are always happy – because there is no question of disappointment as you were never keeping any expectation of returns. I understand that as a human person this is difficult – it is hard in the beginning to justify to oneself of serving but over time you learn the ways. Initially there are forces pulling on you in all directions. Over the years I was fortunate to work with many good people who had similar motive of helping out. The second aspect of community service is being able to work in teams. Not every time every one will agree with you all the time – sometimes your arguments are on the winning side and sometimes on the losing side, but as long as things are being run democratically and there is transparency one can always work towards a common objective. The one final thing is support from family. The value of encouragement and support that your immediate family members provide is priceless. For me philanthropy means contributing ‘time’ is as important as donating ‘money’. Bipin Parekh : Gunjan radio program is run from a radio station that is primarily run by students, it broadcasts from station WUML 91.5 FM since 1950. Monday to Friday the station broadcasts programs run by students. Weekends are given to community – to different ethnic groups. Gunjan has a three-hour time slot on Saturdays 9:00 Am to – Noon. The other ethnic groups that use the same services on the weekends are Portuguese, Latin, Cambodian, French. Mediterranean to name a few. On weekends the station has no staff – it is completely operated by volunteers. In regards to the programming content, I buy and bring music. We do get music in form of donations from community members, some music companies give us their music for free at times. For example, we get classical music from India Archival. Over the last thirty years that I have been at the helm of Gunjan I have been fortunate to have had volunteers who were team members devoting their precious Saturday mornings to run the radio program. Currently I am being helped by Milan Madani, Premal Trivedi, Aditi Tayor, Pravin Ghia, among others. As the producer of the show I make the key decisions. Besides playing music we create a platform for the local community organizations and nonprofits to broadcast their message, inform listeners about their upcoming fund raiser events. We have a pretty wide listening area – and due to the sharing of airwaves with other ethnic groups we find many times even those communities listen and respond to our broadcasted messages. IAGB : How is the programming structured and how do listeners contact you with requests? Bipin Parekh : Our programming format is – first hour we play classical music and some devotional music. The original idea with playing classical music was to introduce the rich and revered South Asian music to New England and also I saw it as an educational aspect of our programming. More recently we are playing devotional songs as it is relatively easier available resource. At times we play Id songs or Shabd but mostly we go by requests – and mostly it is Hindi. Unless we have volunteers who understand other vernacular languages we concentrate our programming on Hindi. The next two hours are dominated by popular music from South Asia with Bollywood dominating it for obvious reasons. We get requests via three channels – through Face Book, email, and On Air call in requests. We announce the theme a week ahead and immediately we see requests start to pour in from friends and longtime listeners. IAGB : What is your personal connection to music? Bipin Parekh : I personally do not have any musical expertise. I am an avid listener and a fan of music. Like most of my generation I grew up listening to Vivid Bharti and Binaca Geet Mala on All India Radio. I am a collector music and books on music – they range from autobiographies of famous musicians to anything that relates to South Asian music. I have volumes on Music history. I use this trove of knowledge – to create trivia and winners are awarded music CDs or some rare times tickets to upcoming shows. I also work as unofficial advisor to local music shows and many times provide trivia during these shows. We are fortunate to get an opportunity to interview many artists who visit Boston and call in to our show. 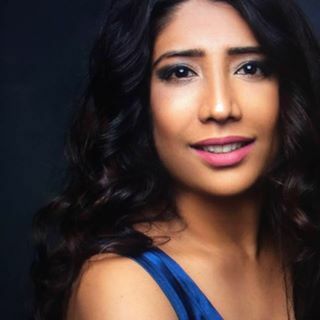 We have had opportunity to interview Asha Bhosle, Shreya Ghoshal, and many others. If they give us complimentary tickets to their shows, we give those out to our listeners. IAGB : After interviewing so many larger than life personalities is there any one particular conversation that stands out for you personally? Bipin Parekh : Yes, and that would be Ameen Sayani – he has the perspective of over 50 years of Indian music. After India got independent there was a moratorium on playing Hindi film music on All India Radio. This prohibition was circumvented by Mr. Sayani by preparing his program and then sending it to Ceylone to broadcast from there. Only after 1965 did the Indian government change rules. That said, I would guess for any Radio Jockey with Indian background Ameen Sayani is like a God. IAGB : How would you encourage next generation Indian Americans to become listeners? Bipin Parekh : Through Gunjan we have observed that many youngsters listen our program – we even get calls in from young kids. Additionally, with increase dance fusion groups in colleges – Indian music has become very popular with this generation and this is a good sign. Additionally, we regularly have high school students volunteering at our station and in exchange they earn credits for community service. We have had some stalwart students like Swati Gupta who started as a student volunteer and continued as a team member. 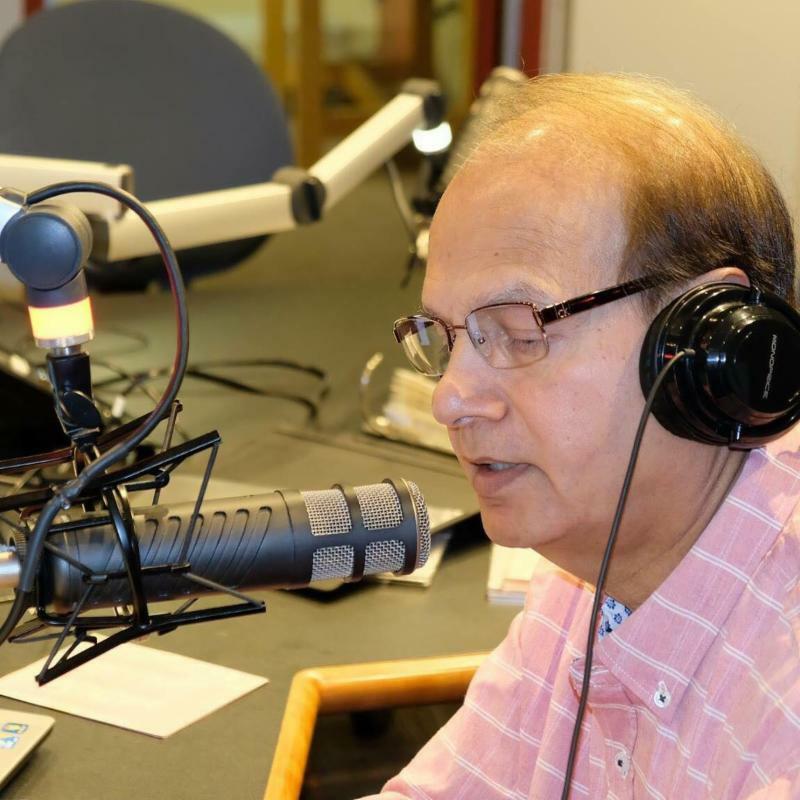 IAGB : What are the prospects for a South Asian Radio program in greater Boston area and what is the future for Gunjan Radio? Bipin Parekh : I have been approached to start a radio channel on Internet but I was not interested. As for establishing a traditional 24 by 7 South Asian radio channel is going to be a challenge. In Boston we do not have the commercial reach and demand to sustain a profitable Indian entertainment radio channel on par with Tri State area. At Gunjan for the last 5 years I have been scouting for team members who are willing to commit full time. I do understand that it is tough to commit every Saturday. Right now we are not there yet, but I am confident that someone from the next generation will step in and continue this venture. IAGB : What is the secret to convert people into volunteers? How would you encourage commitment towards donating time? Bipin Parekh : We have to understand that there is opportunity cost to serving community – time spent in community service is time not spent making more money or following a hobby or even spending time with family. But then each has to ask one question to themselves – what makes you happier – and to significant number of people – giving back to community makes them happier than a few additional dollars in their personal accounts – it is such people we need to identify, motivate, and nurture to become the future community leaders. IAGB : I wish I had …. Bipin Parekh : More time with my parents. Bipin Parekh : Mahatma Gandhi – I think he did everything unconditionally. It is unfortunate that in recent times people are rewriting history and casting doubts on his service – but for me he was the epitome of selflessness in the service of not just the community but humanity. Bipin Parekh : I wish to inspire more number of people as volunteers, I wish to inspire more people to be charitable with their time, I wish to see more people inculcate a habit of giving back to the community selflessly. 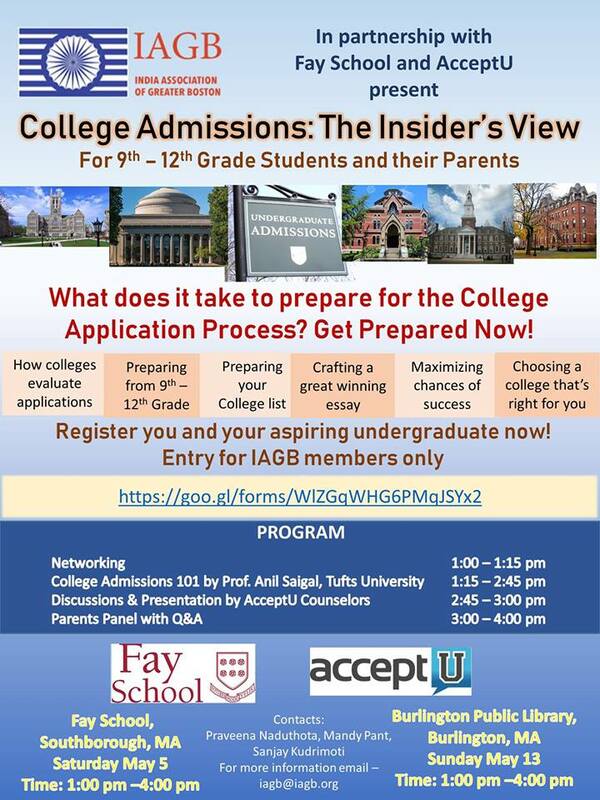 In partnership with Dr. Anil Saigal and a Panel of parents whose kids are presently in college, IAGB will organize a ‘College Prep’ workshop. 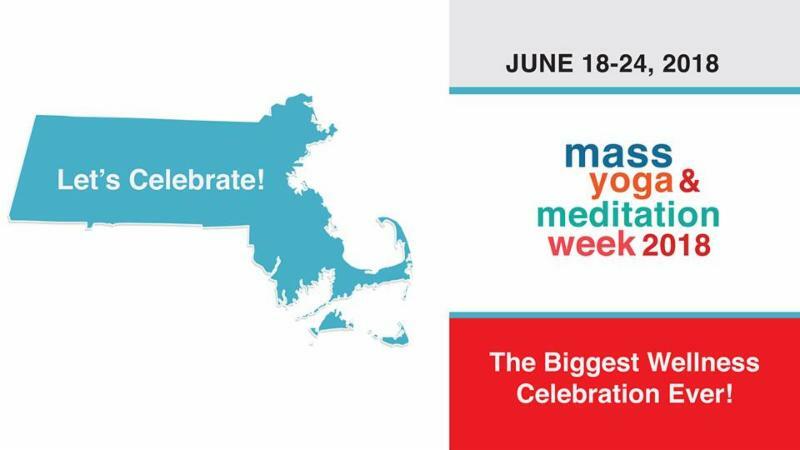 This workshop will be organized in two locations, Fay School, Southborough (5/5) and Burlington Public Library (5/13). It is a member ONLY event. Attendance is free for members, but seating is limited. 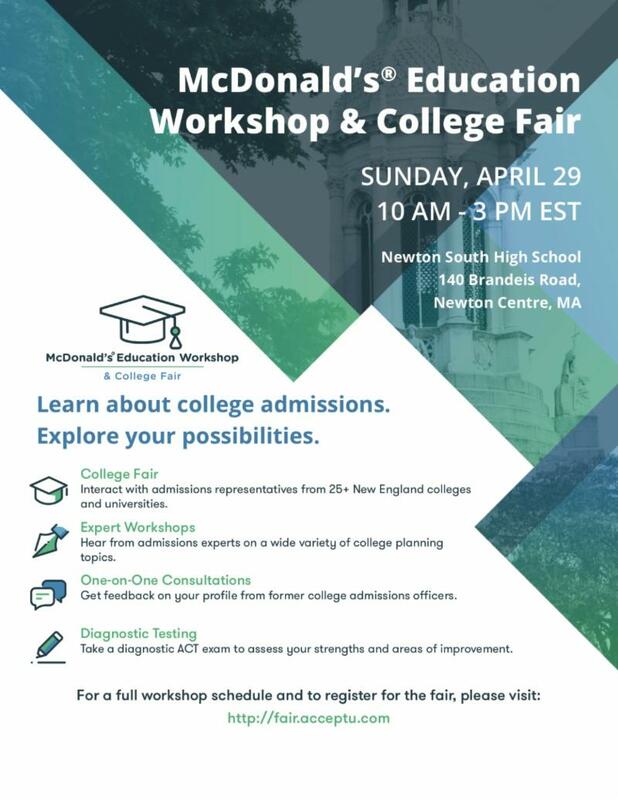 The workshop will inform and educate about the next steps involved in the process of college admissions for your child(ren) and all the things you need to know leading up to that. Sign up details can be found on the brochure seen here. If you have any questions, please send an email at iagb@iagb.org . IAGB will celebrate India's 71st Independence Day on August 19th, 2018 at Boston City Plaza. Please mark your calendars. Announcements for submissions of cultural programs entries will be made soon. Stay tuned. Just a few years back, when I was holding my grounds firmly over an idea at work, I received a compliment that I fight like a man! That caught me off guard, as I couldn’t respond that it’s ok to be decisive, strong headed and determined for women when needed, it’s NOT unfeminine! It’s uncanny how we associate “like a man” and “like a woman” paradigms to various behaviors. Historically we, as a society, have associated athletic, fearless, rational behavior with men, but sensitivity, emotions, soft-spoken manner, and submissiveness are considered feminine attributes much needed to be womanly. But it’s time to challenge the age-old prevalent gender stereotype; women can be strong, athletic, political heroes who rule the world. 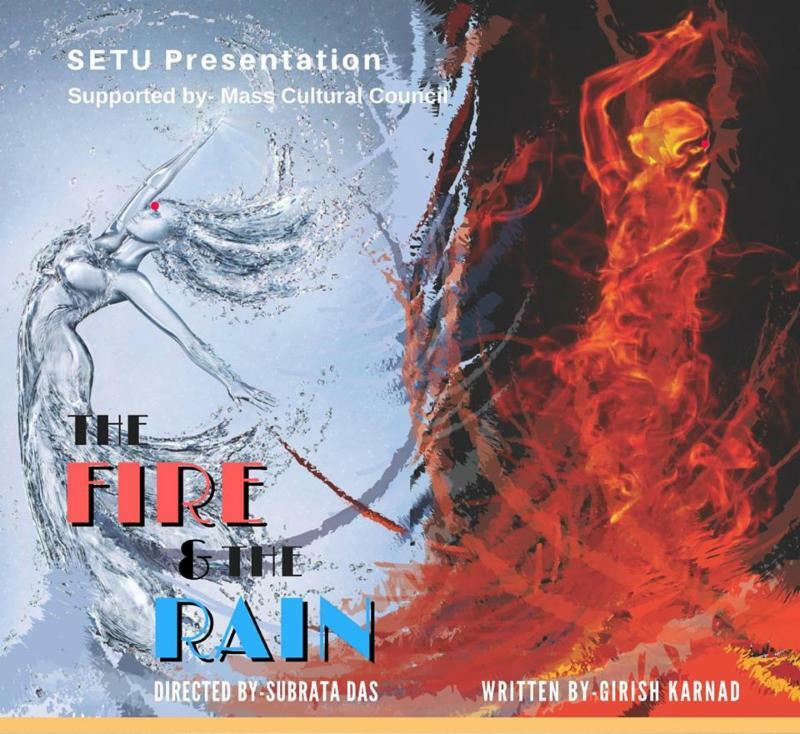 SETU’s next play -The Fire and The Rain has an all-female cast, not to prove that women can act like men, but to prove that women can take on the pugnacious and baneful roles that were normally written for male actors. These female actors don multiple roles, of the mother, daughter, wife, entrepreneur, writer, dancer and many more in their real lives being strong, smart, decisive, fearless and sometimes ruthless. They will be exploring those same dimensions on the stage playing fearless, masculine, aggressive, complex men characters in Fire and Rain bringing to the audience’s attention the unspeakable bias and gender stereotype that is often accepted as a norm in the society. SETU’s play The Fire and The Rain is written by Girish Karnad and directed by Subrata Das. The cast of 25 actors and dancers will take part in this play for a dramatic portrayal of various Vedic and tribal community rituals along with conflicting human emotions of jealousy, betrayal, deceit, as well as selfless love and sacrifice. Its hero (played by a female actor) is torn between moral righteousness, love, and duty. Would he choose the love of his life or duty towards people who are suffering from drought last 10 years? Come and watch this riveting drama at Belmont Town Hall 27 th April -29 th April 2018, tickets are available at https://setu.us/tkts/ . SETU is a non-profit theater group with a mission to bridge the cultural gap between Indian and Western culture. It is supported by Mass Cultural Council Grant. 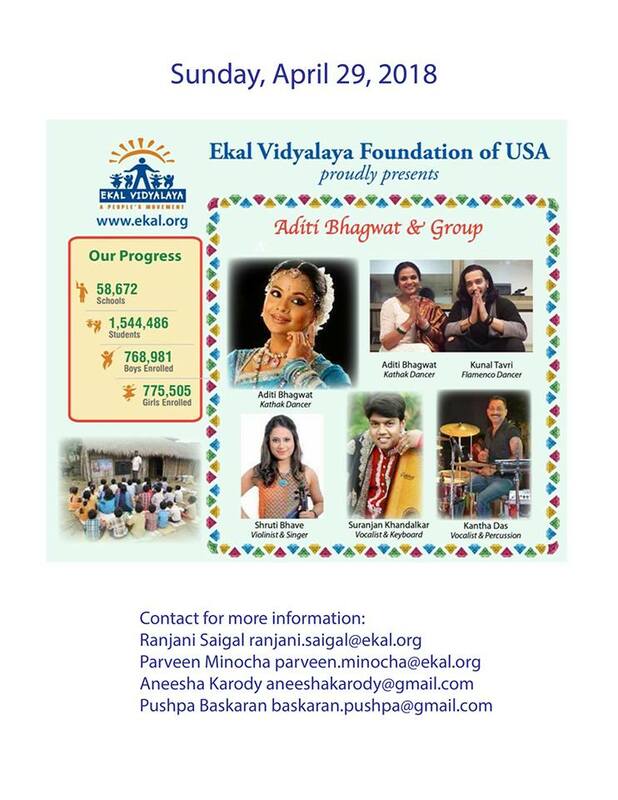 We invite you to join us for the Ekal Vidyalaya Boston's 2018 annual fundraising event on 29April2018. Internationally renowned Kathak and Lavani expert, actress and dance tutor Aditi Bhagwat and team will be performing.